St Mary's Cathedral has faithfully served the needs of the Archdiocese and the community for almost 150 years; however, the effects of both time and an inconsistency in its development over the years have certainly taken their toll. 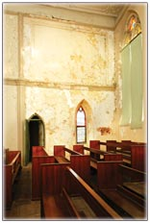 The first stage of the Cathedral, completed in 1865, is noticeably suffering from age, water damage and structural weakness. Bricks used in the construction of the Cathedral are extremely porous and as external render has eroded over time, rain has penetrated the brickwork resulting in a crumbling of the material. This has caused serious damage to the internal plaster. 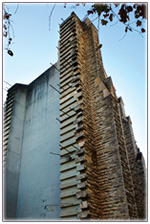 The Bell Tower foundations require urgent attention – it is now considered an almost unsafe structure. Major reinforcing and underpinning of the foundation are required to stabilising the building. In the 1930 Cavanagh section of the Cathedral, the guttering has all but eroded, the electrical wiring needs complete replacement and the mosaic Sanctuary floor requires restoration following damage caused by the Meckering earthquake in 1968. The Sanctuary of the original Cathedral was removed in 1929 and replaced by two transepts and a new Sanctuary. the Cavanagh design called for the replacement of the entire original Cathedral; however, this could not be achieved due to cost and other considerations. This resulted in an amalgam of two parts which nobody then or since has considered to be a complete Cathedral - architecturally, aesthetically or liturgically. Our cathedral does not provide for the contemporary liturgical needs of the Archdiocese nor does it adequately provide for its Parish, Civic or Community responsibilities. Our cathedral must provide for all people to actively and fully participate in the Sacred Liturgy. Existing internal columns inhibit line of sight to the Sanctuary and greatly limit seating capacity. Acoustics are very poor resulting in those seated at the rear of the Cathedral unable to hear or participate fully in services. The elongated nature of the Nave, with the Sanctuary located at the northern end, does not provide for modern liturgical needs. There is a lack of adequate meeting, function, toilet, educational and visitor facilities at St Mary's Cathedral, which impacts on parishioners, visitors, members of the Archdiocesan and general communities.